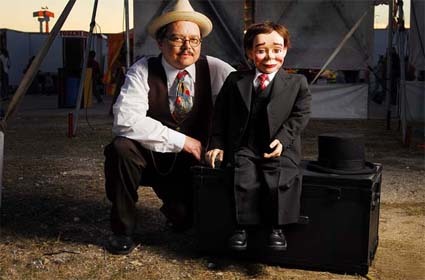 David Pitts and Henry Little have been working together for several years, this past season they appeared on Jim Zajicek's Big Circus Sideshow in Austin TX. 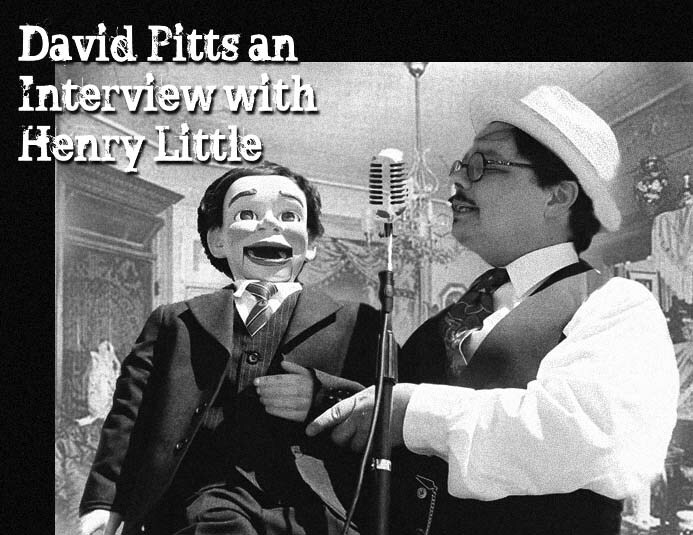 I would like to thank David for taking his time to do this interview with Henry for Sideshow World. DP: First off take your time and just answer the questions like I'm a stranger, like we just met, like I don't know anything, OK? HL: I just have to act like you don't know anything? HL: Like you're a total ignoramus? A complete idiot? HL: An absolute moron, utterly without a clue, dumb as a box of turds..
HL: I can do that. DP: Ok. So what do you prefer to be called? HL: Mr. Little to you, we just met, remember? 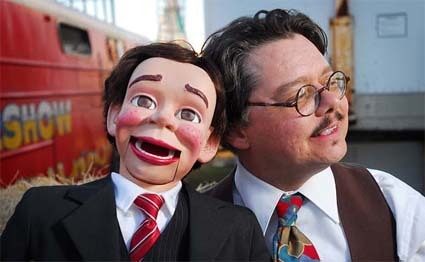 DP: I mean do you prefer "Ventriloquist Figure", "Puppet"...."Dummy"? HL: Some people call us 'Wooden Americans" or 'Mannequin Americans". Speaking for myself, onstage I like "dummy", there's always a way to turn that around and get a laugh out of it. That's what I'm about, getting laughs, that's what I was made for. DP: So you were born to be a comedian? HL: Born, made, built, assembled.. whatever, yeah! DP: Regarding that very thing, what was your first memory? Was it before or after I built you? Do you remember being just parts or being painted? HL: My first memory was when your wife saw me for the first time. DP: Right, I had stayed up late finishing your paint and installing your eyes. She hadn't seen you all put together before that morning. Do you remember her response? HL: She screamed. You should have warned her. I don't think she ever got over the initial shock, she still doesn't like me. DP: Do you think she's afraid of you? HL: No, she just doesn't like me. DP: Have you ever encountered someone who was genuinely afraid of you? HL: Like a real phobia? DP: Automotonaphobia, fear of automatons.. puppets. People who have this fear are called Automotonophobes. HL: Thank you Mr. Know-It-All. 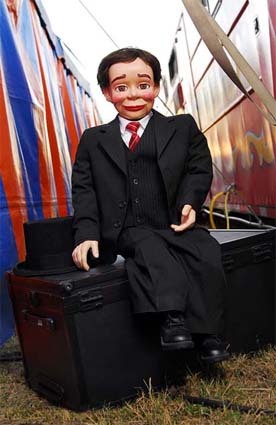 Yeah, I've met a few people who were kind of creeped out by ventriloquist dummies. 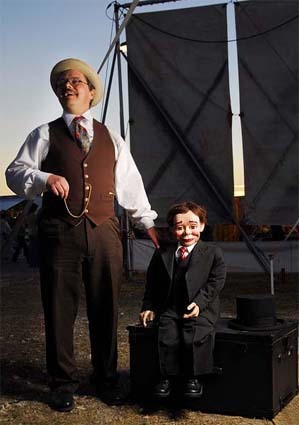 I've met a lot more people who are creeped out by ventriloquists though. DP: Really? What are they called? DP: But seriously, have you ever encountered anyone who had a real phobia of puppets? HL: You're talking about that girl at our very first show together, right. Yeah, that girl, a high school age kid. Well, there we were, there you were really, doing your circus show for this group of high school kids, idiot that you are, you're a brave idiot though, I'll give you that. The show's actually going ok. I could hear them laughing from inside my suitcase where I'm waiting to go on. That was my old suitcase, the one you got from Goodwill. I guess that was my first apartment really. It smelled like dirty socks, just like everybody's first apartment. DP: But that's beside the point. HL: The journey is the point, Grass-hopper, not the destination. Let me tell it like I tell it...So I'm laying there in my stinky suitcase apartment, and I hear you introducing me, that bit you do about needing to make a new friend..
HL: Right, and then I start hearing this girls voice, at least I think it's a girl, she sounds like some kind of animal. She's doing this low whine that starts turning into almost a wailing sound, primal fear is what I'm hearing. I hear you ask her if she's afraid of ventriloquist dummies. She says 'yes', but she tells you it's ok and to go ahead with the act. I hear you say "are you sure?" and I'm thinking ABORT ABORT ABORT, MAYDAY MAYDAY! But you have absolutely no sense, so you open the case and get me out and there she goes, trying to crawl underneath the kid next to her, and doing that primal moaning thing louder now. DP: So what did you do. HL: What COULD I do? I started doing the jokes. HL: No, we DIED, it was horrible. Thanks for dredging up this painful memory. I layed there in my suitcase the rest of the show wishing I WAS dead. I was going to quit show business. DP: But you didn't quit. HL: You wouldn't let me. You needed the money and we were getting bookings. We are in great demand by people who don't know any better. DP: How did you get over the first show? How were you able to move on from there and get on stage again? HL: I realized that the fiasco of our first show wasn't my fault,.. it was yours. Once I saw that I got over my fear. That's the great thing about having a partner, I always know who to blame. DP: Have the shows gotten better? HL: Oh yeah, way better. It's not so bad I guess, to do the worst show you can imagine the first time out. Then you're done with that and it can only get better. The audience at our last show even asked for me to do an encore. It was great. I really love a good show, a great audience and a good show, man, there's nothing better than that. HL: Our timing's better. The costuming's better, that makes a difference too. Mostly our material's just better. DP: What kind of material do you like to do? HL: Old fashioned, straight ahead comedy. Set-up, punch-line stuff, it still works great. People like it, they get it. I learned that from Ward Hall, it was great advice. Another thing that works great is just flirting with the girls and picking on the guys in the audience. But that works best with adult audiences. DP: Do you ever do 'blue' material with adult audiences? HL: Dirty stuff, nah. I know I have some kind of reputation for that, and I got nothing against a good dirty joke backstage or in the backyard, but on stage I'm strictly Sunday School. If you're a forty miler, like we are, you gotta work clean. If you don't, the church groups and civic clubs you're doing shows for, they might laugh, but they won't book you again. DP: You mention your 'reputation', how did you get a reputation for being..uhm..
HL: A reprobate, a dissolute Pinocchio born and raised on Pleasure Island without even a cricket to serve as my conscience? HL: Hernan and the Yahoo group. I posted a couple of times and that damn Hernan just jumps all over it, starts talking about me like I'm his girlfriend or something. DP: Did that bother you? HL: Hah, no, not me. I'm a puppet, what do I care about that stuff. I kind of like the bad boy rep. It's YOU that's all uncomfortable with Hernan's sense of humor. DP: No, I think Hernan's funny, he can just be kind of over-the-top sometimes. HL: Uh huh, sure. That's why you're always going on about how you're the 'straight man' and I'm the 'funny guy', sounds a little like overcompensating to me. DP: I know you finally got to meet Hernan, the one who started all those rumors. What did you say to him? DP: Tell us more about that day. HL: It was the best. 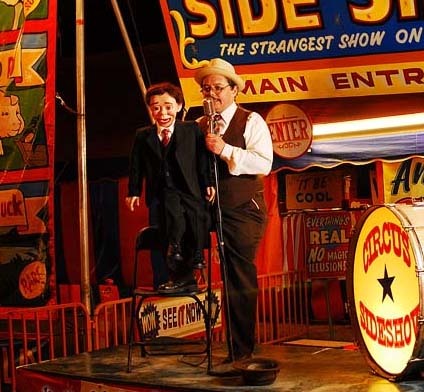 Jim Zajicek invited us to come perform at the Big Circus Sideshow when they were in Austin. He even helped us write our bally. Good stuff too, I'm still using some of those lines. We got to meet and hang out with Jim, Lori Ballard, Josh, Mark, Rick West and Gatorman, and of course Hernan. We worked the bally off and on all day, visited, just a great day. I stayed right there on the bally stage while Hernan blew huge blasts of fire. I guess I got over my fear of fire and Hernan both. Lori and Rick took lots of great shots. It was a perfect day. Perfect. I'd do it again in a heartbeat. I'd stay longer too if you weren't so whipped. DP: I have responsibilities at home. HL: Yeah, yeah. We're going to be forty milers forever aren't we? DP: Probably, but I'd like to hear about your goals anyway. HL: I'd like to get paid, David, that's my main goal right now. HL: I'd like to try comedy clubs. I want to help you write that pitchcard comic book you've been talking about. Hopefully we can do some work on Barbara Hoffmann's show soon too. Plus I really want to put together a sideshow or a museum of some kind. I want us to frame a show. I'll do the bally, you sell the tickets. 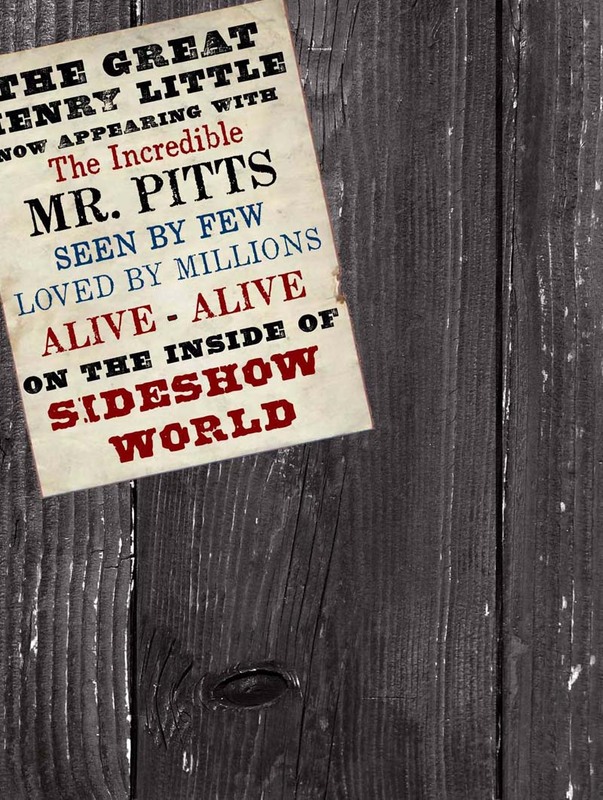 I love sideshows, I love circuses. I have sawdust in my veins... literally. DP: Thanks for taking your time to do this interview Henry. I couldn't have said it better myself! 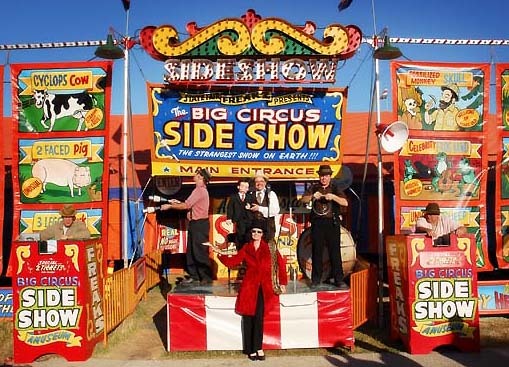 The Group shot in Austin TX of the Big Circus Sideshow - Left to right - James Zajicek, Josh Bladzik, Henry Little, David Pitts, Hernan Cortez, Mark Pierson bottom Lori Ballard with Julius Squeezer.